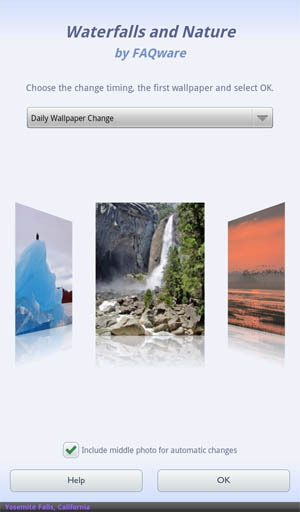 Get our Waterfalls and Nature Wallpapers app in the Nook Marketplace! Natures wonders that inspire tranquility and relaxation! Adorn your NOOK with 40 quality photos. 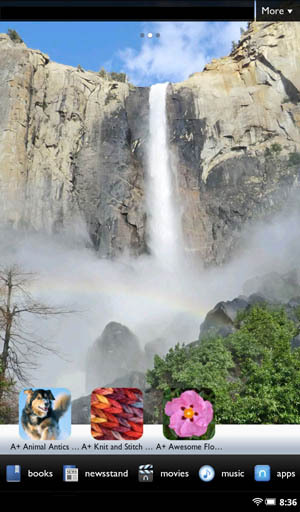 Enjoy plenty of waterfalls, dramatic glaciers, snow covered mountains, sunsets over water, lakes shrouded in fog, autumn trees mirrored in ponds and more. Each selected and optimized specifically for the NOOK. Choose your favorite photos to view and have photos change automatically each week, day or hour. Easily change photos with a swipe. Have fun personalizing your NOOK home and lock screens. Also check out our "Beaches and Sunset" wallpapers. 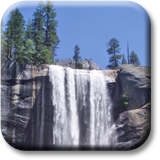 From here, just select the Live Wallpaper tab and tap the Waterfalls and Nature choice.